Southwest into the land of 'Ksan or the Skeena River, this area has been travelled and used by Native peoples for over 8,000 years and continuously occupied for at least 4,000 years. The Skeena, which provided them with food and transportation, still offers visitors good angling oppurtunities. One of the world's most famous steelhead fishing spots, the Kispoix River, is one of the river's major tributaries. West towards the coast you will notice lush cedar and hemlock forests. Named for Father Adrien Gabriel Morice, an explorer and Catholic missionary, Moricetown is located on Highway 16, 32 km (20 miles) beyond Smithers. The Wet'suwet'en people have fished this short, narrow canyon of the Bulkley River for centuries. These three Hazeltons are all located very near the junction of the Bulkley and Skeena Rivers. New and South Hazeltons were established with the building of the Grand Trunk Pacific Railway. Both provide full services for visitors. The Hazelton Infocentre is located at the junction of Highways 16 and 62. 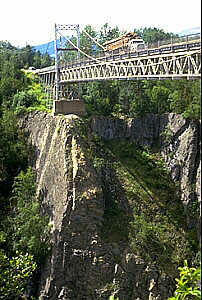 Turn north off of the Yellowhead Highway onto Highway 62 at the Infocentre and cross the Hagwilget suspension bridge over the rushing Bulkley River 76m (250 feet) below. Visit the 'Ksan Village Museum where you can tour long houses and view cultural exhibits. See an original steam donkey, paddle wheelers and 100 year old St. Peter's Anglican Church. 13km (8mi) north of Hazelton on Hwy 62 on the Kispiox Valley Road is the village of Kispiox. The traditional Gitksan village of Kispiox is located at the junction of the Kispiox and Skeena Rivers. The Frog, Wolf and Fireweed clans display some of their beaautiful totem poles here. Fishing camps, guides and rafting tours are located on this exceptional steehead river. Returning to the Yellowhead Highway you will continue to Prince Rupert. The junction for Hwy 37 North (the Stewart-Cassiar Hwy) is located 42 km (26 miles) from the Hazeltons. Traveling west you will pass the Seven Sisters Mountain Peaks, The Boulder Creek Rest Area, Skeena River Boat Passage, Sanderson Point Rest Area, Usk Ferry and the Kleanza Creek Provincial Park.